This action of the Pope’s means that several of the 20th century popes have been raised to the altar: John Paul II, Paul VI, John XXIII, Pius X. We ought to keep in mind that John Paul I and Pius XII have their causes for sainthood being studied, too. The emeritus pope Benedict XVI was present for the Mass. 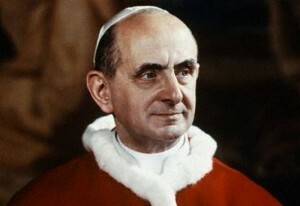 On this day of the Beatification of Pope Paul VI, I think of the words with which he established the Synod of Bishops: “by carefully surveying the signs of the times, we are making every effort to adapt ways and methods… to the growing needs of our time and the changing conditions of society” (Apostolic Letter Motu Proprio Apostolica Sollicitudo). When we look to this great Pope, this courageous Christian, this tireless apostle, we cannot but say in the sight of God a word as simple as it is heartfelt and important: thanks! Thanks! 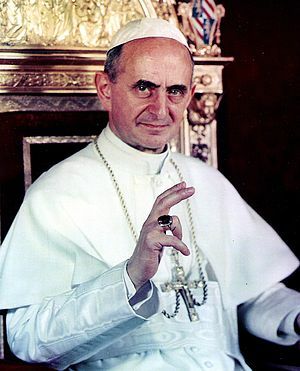 Thank you, our dear and beloved Pope Paul VI! Thank you for your humble and prophetic witness of love for Christ and his Church! In his personal notes, the great helmsman of the Council wrote, at the conclusion of its final session: “Perhaps the Lord has called me and preserved me for this service not because I am particularly fit for it, or so that I can govern and rescue the Church from her present difficulties, but so that I can suffer something for the Church, and in that way it will be clear that he, and no other, is her guide and saviour” (P. Macchi, Paolo VI nella sua parola, Brescia, 2001, pp. 120-121). In this humility the grandeur of Blessed Paul VI shines forth: before the advent of a secularized and hostile society, he could hold fast, with farsightedness and wisdom – and at times alone – to the helm of the barque of Peter, while never losing his joy and his trust in the Lord. Paul VI truly “rendered to God what is God’s” by devoting his whole life to the “sacred, solemn and grave task of continuing in history and extending on earth the mission of Christ” (Homily for the Rite of Coronation: Insegnamenti I, 1963, p. 26), loving the Church and leading her so that she might be “a loving mother of the whole human family and at the same time the minister of its salvation” (Encyclical Letter Ecclesiam Suam, Prologue). 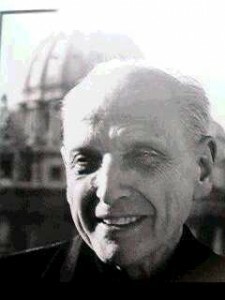 Today is the 45th anniversary of the Servant of God Father Pedro Arrupe’s letter to the Society of Jesus on the Servant of God Pope Paul VI’s teaching, Humanae vitae. This is the first time I’ve seen this letter and it portrays the Jesuit’s in a different light, one that is unexpected and consistent with what we know to be the mind of Saint Ignatius and the Church. Without a doubt, Father Arrupe wrote a beautiful letter, too bad it was buried for so long. We are all aware of the response given to the most recent encyclical of Pope Paul VI, Humanae vitae, about the problems raised by the question of contraception. While manycompletely accept the teaching of the encyclical, a number of the clergy, religious and laity violently reject it in a way that no one in the Society can think of sharing. Yet, because the opposition to the encyclical has become widespread in some places, I wish to delay no longer before calling to mind once more our duty as Jesuits. With regard to the successor of Peter, the only response for us is an attitude of obedience which is at once loving, firm, open and truly creative. I do not say that this is necessarily painless and easy. In fact, on various grounds and because of particular competence, some of us may experience certain reservations and difficulties. A sincere desire to be truly loyal does not rule out problems, as the Pope himself says. A teaching such as the one he presents merits assent not simply because of the reasons he offers, but also, and above all, because of the charism which enables him to present it. Guided by the authentic word of the Pope- a word that need not be infallible to be highly respected – every Jesuit owes it to himself, by reason of his vocation, to do everything possible to penetrate, and to help others penetrate, into the thought which may not have been his own previously; however, as he goes beyond the evidence available to him personally, he finds or will find a solid foundation for it. To obey, therefore, is not to stop thinking, to parrot the encyclical word for word in a servile manner. On the contrary, it is to commit oneself to study it as profoundly as possible so as to discover for one self and to show others the meaning of an intervention judged necessary by the Holy Father. Once we have correctly grasped the meaning of the encyclical, let us not remain passive. Let us not be afraid to rectify our teaching, if need be, while at the same time explaining why we are doing so. Let us develop our teaching as profoundly as possible rather than restrict it. Let is strive for a better pastoral theology of the family and of the young people. We must not forget that our present world, for all its amazing scientific conquests, is sadly lacking a true sense of God and is in danger of deceiving itself completely. We must see what is demanded of us as Jesuits. Let us collaborate with others in centers of the basic research on man, where the specific data of Christian revelation can be brought together with the genuine achievements of the human sciences and thus achieve the happy results that can be legitimately anticipated. In all this work of sympathy, intelligence, and love, let us always be enlightened by the Gospel and by the living tradition of the Church. Let us never abandon the papal teaching we have just received. Rather, we must continually seek to integrate it into an ever-widening anthropology. The present crisis makes clear this urgent need. You understand well that it is the spirit of the Constitutions which inspires me as I write these words. For, as the Constitutions tell us in substance, each member of the Society must remember that his personal manner of serving God is realized through a faithful obedience to the Roman pontiff. That is why I am certain that today too, the Society is able to show itself worthy of four centuries of complete fidelity to the Holy See. It certainly cannot be said that the Second Vatican Council has changed all this. The Council itself speaks formally of “this religious submission of will and of mind,” which “must be shown in a special way to the authentic teaching authority of the Roman pontiff, even when he is not speaking ex cathedra. That is, it must be shown in such a way that his supreme magisterium is acknowledged with reverence and the judgments made by him sincerely adhered to according to his manifest mind and will” (Lumen Gentium, n.25). Nor can it be said that the Pope was speaking of matters that do not involve our faith, since the essence of his teaching directly concerns the human and divine dignity of man and of love. In the enormous crisis of growth which envelops the whole world, the Pope himself has been what the entire Church must be, and Vatican II affirmed, “both a sign and a safeguard of the transcendence of the human person” (Gaudium et Spes, n.76). For this reason the service we as Jesuits owe to the Holy Father and to the Church is at the same time a service we owe to humanity itself. In my awareness of our obvious duty as Jesuits I could say much more, particularly at this time which seems to me crucial for the Church. Difficult times are times made for the Society, not to seek its own glory, but to show its fidelity. This is why I am certain that all of you will understand my words. As for those for whom the encyclical presents personal problems of conscience, I wish to assure them that for that very reason I am keeping them in my affection and prayers. May St. Ignatius help each of us to become, with the aid of the Holy Spirit, more Ignatian than ever. May he obtain for us the understanding that our legitimate desire to be totally present to this world demands of us an ever-increasing fidelity in the service of the Church, the Spouse of Christ and the Mother of all mankind. I commend myself to the prayers of all of you. The Venerable Servant of God Pope Paul VI died on this day in 1978, the Feast of the Transfiguration. He was the Roman Pontiff for 15 years. Notable in his pontificate were several events: the closing of the Second Vatican Council, the erection of the created a Secretariat for non-Christians, later renamed the Pontifical Council for Interreligious Dialogue, the publication of 7 encyclicals including the most contentious of the 20th century, Humane Vitae, the mutual lifting of the ex communications between Rome and Constantinople (Patriarch Athenagoras) and the meeting with Pope Shenouda III (of Egypt) resolving Christological differences, the meeting with Archbishop Michael Ramsey of Canterbury, plus he held 6 consistories that created 143 cardinals. The reform of the sacred Liturgy is likely the one enduring bone of contention that gets lots of people riled up to this day. It must be said in my opinion, not all the problems that Paul faced were of his making. Society was haywire which adversely affected the Church in all quadrants. Back in June the Vatican newspaper published a translation of a homily likely never read in English by many Americans given to honor the deceased Pontiff by the cardinal-archbishop of Munich, Joseph Ratzinger. In a homily given by Joseph Ratzinger recalling Pope Paul VI, he said, “the transfiguration promised by the faith as the transformation of man is above all a journey of purification, a journey of suffering. Paul VI accepted his papal service increasingly as a transformation of faith in suffering. The last words of the Risen Lord to Peter, after constituting him as the Shepherd of his flock, were: “when you are old, you will stretch out your hands, and another will gird you and carry you where you do not wish to go” (Jn 21:18). It was a reference to the cross awaiting Peter at the end of his journey. It was, in general, a reference to the nature of this service. Paul VI let himself be lead more and more where as a human being he did not want to go alone. More and more the pontificate meant for him wearing the cloth of another, being nailed to the cross. (…) He gave new value to authority as service, bearing it as suffering. He took no pleasure in power, in position, in a successful career; and it was precisely because of this, his dutiful authority – ‘they will lead you where you do not want to go’ – became great and credible. Paul VI carried out his service by faith. From this derived both his firmness and his willingness to compromise. For both he was criticized, and some comments after his death were even in bad taste. But today a Pope who isn’t criticized would be failing to carry out his duty to this age. Paul VI resisted the intense scrutiny of the media, the powers of the day. He could do this because he didn’t consider success and approval the measure of truth and faith, but rather his conscience. Those who met him in his last years were able to experience directly his extraordinary transformation in faith, its transfiguring power. One could see how much the man, who by his nature was an intellectual, surrendered himself day after day to Christ, how he let himself be changed, transformed, purified by him, and how this made him ever more free, ever more profound, good, perceptive and simple. Faith is a death, but it is also a metamorphosis for entering into authentic life, towards transfiguration. In Pope Paul one could see all this. Faith gave him courage. Faith gave him goodness. And in him it was also clear that a faith of conviction is not closed but open. In the end, our memory will treasure the image of a man who held out his hands. He was the first Pope to have travelled to all the continents, fixing in this way an itinerary of the Spirit, which began in Jerusalem, the centre of meeting and of parting of the three great monotheistic religions; then his journey to the United Nations, to Geneva, his meeting with humanity’s greatest non-monotheistic religious cultures, India, and his pilgrimage to the people who suffer in Latin America, in Africa, in Asia. Faith holds out its hands. Its sign is not a fist, but an open hand”. 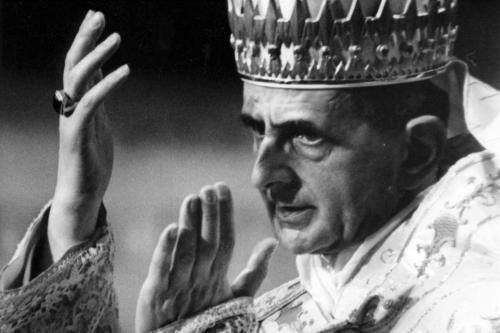 Pope Paul VI, of blessed memory, died on this date in 1978. In history, late summer at that time became known as the year of three popes. Paul’s now being consider for sainthood and thus carries the ecclesial title of Servant of God. His last Last Will and Testament follows. Thought it would be interesting to read; there are some key interesting statements of faith and person. Some notes for my testament. 1. I fix my gaze on the mystery of death, and on what follows it, in the light of Christ which alone can brighten it, and for this reason with simple and serene trust. I recognize the truth, which for me has always reflected on present life regarding this mystery, and I bless the victor over death for having escaped its shadows and unveiled the light. Thus before death, in total and definitive separation from the present life, I feel the duty to celebrate the gift, the good fortune, the beauty, the destiny of this very fleeting existence. Lord, I thank you that you have called me to life, and still more that, by making me a Christian, you have regenerated and destined me for the fullness of life. Likewise I feel the duty to thank and to bless those who were mediators for me of the gifts of life bestowed on me by you, O Lord: those who brought me to life (Oh! May my most worthy parents be blessed! ), those who educated me, wished me well, were kind to me, helped me and surrounded me with good example, attention, affection, trust, kindness, courtesy, friendship, faithfulness, respect. I am thinking with thanks about the natural and spiritual relationships which have given origin, aid, comfort and significance to my humble existence. How many gifts, how many beautiful and noble things, how much hope have I received in this world! Now that the day is setting, and all is finishing and this stupendous, dramatic temporal and earthly scene is disappearing, how again can I thank you, O Lord, for the gift of faith and of grace, higher than the gift of natural life, in which at the end my being takes refuge? How can I worthily celebrate your kindness, O Lord, for having been included just as I entered into this world, in the ineffable world of the Catholic Church? For having been called and initiated into the priesthood of Christ? For having the joy and mission of serving souls, brothers, youth, the poor, the people of God, and for having the unmerited honor of being a minister of the holy Church, in Rome especially, next to the Pope, then in Milan as archbishop on a throne too exalted for me, the most venerable throne of Sts. Ambrose and Charles, and finally on that supreme, most formidable and most holy throne of St. Peter? I will sing out the Lord’s mercies forever. May all those whom I have met on my earthly pilgrimage be blessed and saluted: those who were my collaborators, counsellors, and friends–and they were many, such good people, generous and dear! Blessed be those who welcomed my ministry and were my sons and brothers in Our Lord! To you, Ludovico and Francesco, brothers in blood and spirit, and to all you dear ones of my home, who never asked anything of me, and never had from me any earthly favor, and who always gave me an example of human and Christian virtues, you who understood me with so much discretion and cordiality and who above all helped me to seek in the present life the life of the future — my peace and my benediction be with you. The mind turns back and its horizons broaden around me, and I know well that this farewell would not be a happy one, were I not to remember to ask pardon of those I’ve offended, failed to serve or failed to love enough, and to ask pardon of anyone who desires it of me. May the Lord’s peace be with you. I feel that the Church surrounds me. O holy Church, one, catholic and apostolic, receive my supreme act of love with a salute and blessing. To you, Rome, diocese of St. Peter and of the vicar of Christ, most beloved to this last servant of the servants of God, I give my most paternal and full blessing so that you, city of the world, will be always mindful of your mysterious vocation and with human virtue and Christian faith, know how to respond to your spiritual and universal mission, however long will be the world’s history. And to all of you venerated brothers in the episcopate, my cordial and reverent greeting. I am with you in the one faith, in service together to the Gospel, for the building up of the Church of Christ and for the salvation of all humanity. To all priests, to men and women religious, to students in our seminaries, to militant and faithful Catholics, to youth, to the suffering, the poor, seekers of the truth and justice, to all, the benediction of the Pope who is dying. And thus, with special reverence and recognition for the lord cardinals and for all the Roman Curia: Before you who surrounded me most closely, I profess solemnly our faith, I declare our hope, I celebrate our charity which does not die by accepting humbly from divine will the death which is my destiny, invoking the great mercy of the Lord, imploring the clement intercession of most holy Mary, of the angels and saints, and recommending my soul to the remembrance of the good. 2. I name the Holy See my universal heir: I owe it duty, gratitude, love. Except for the dispositions herewith indicated. 3. My private secretary is to be executor of my testament. He will want to take counsel with the secretariat of state and conform to the juridical norms in force and to good Church custom. 4. Concerning the things of this world: I have decided to die poor and thus simplify any question in this regard. As for possessions and properties which I still have from my family, my brothers Ludovico and Francesco are to dispose of them freely; I beg of them some remembrance for my soul and for those of our dead. May they bestow some alms on needy persons and good causes. May they keep for themselves, and give to those who merit and desire it, some memento from among the possessions, religious objects or books belonging to me. May the notes, notebooks, correspondence and my personal writings be destroyed. Concerning the other things which can be considered my own: My personal secretary is to dispose of them, as executor, keeping some mementos for himself and giving some small object as a memory to my best friends. I would like manuscripts and notes written in my own hand to be destroyed; and may the correspondence received of a spiritual and confidential nature which was not intended to be shown to others be burnt. If the executor cannot see to this, may the secretary of state take on the job. 5. I strongly urge my possessions be disposed of for proper remembrances and as generous contributions, as much as possible. About the funeral: May it be pious and simple. (May the catafalque now in use for pontifical funeral rites be substituted by a humble and decorous contrivance.) The tomb: I would like to be in real earth, with a humble marker indicating the place and asking for Christian mercy. No monument for me. 6. And concerning what counts most, my departure from this world’s scene and my journey to meet the judgment and mercy of God: I would have so many, many things to say. On the state of the Church: May she listen to a few of our words, uttered with seriousness and love for her. Concerning the Council: May it be brought to a good climax and be executed faithfully. Regarding ecumenism: May the work of bringing together separated brothers proceed with much understanding, patience and great love, but without defecting from true Catholic doctrine. Concerning the world: Do not think the Church can help it by assuming its thoughts, customs, tastes, but rather by studying it, loving it, serving it. I close my eyes upon this sad, dramatic and magnificent earth calling once again still on divine kindness. I again bless everyone. Especially Rome, Milan, Brescia. A special blessing and greeting to the Holy Land, the land of Jesus, where I was a pilgrim of faith and peace. And to the Church, to the most beloved Catholic Church, and to the whole of humanity, my apostolic blessing. Then: Into your hands, O Lord, I commend my spirit. 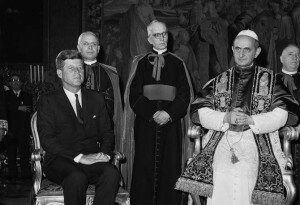 June 30, 1965, third year of our pontificate. Into your hands, O Lord, I commend my spirit. My soul magnifies the Lord. Mary! I believe. I hope. I love. In Christ. I thank those who have done good to me. I ask pardon of those to whom I have not done good. I give peace to all in the Lord. I greet my dearest brother Ludovico and all my relatives and friends, and those who have welcomed my ministry. To all collaborators, thank you. Especially to the secretariat of state. I bless Brescia, Milan, Rome, and the whole Church with special charity. How lovely is your dwelling place, O Lord! May everything that is mine go to the Holy See. May dear Don Pasquale Macchi, my private secretary, see to providing for some remembrances and benefices and giving some memento among my books and objects to dear ones. I do not want a special tomb. Some prayers that God may be merciful. In you, O Lord, have I placed my hope. Amen, alleluia. To all my blessing, in the name of the Lord. Castelgandolfo, Sept. 16, 1972, 7:30 am. Addition to the dispositions of my testament. I want my funeral to be very simple and I do not want any special monument. Some remembrances (benefices and prayers).